Consider a wheel that rolls on a surface, without slipping, as shown below. Dynamics problems that involve rolling with relative slipping are more complicated than problems that involve pure rolling. This is because you have to account for the direction of slip in order to determine the direction of (kinetic) friction, at the contact surface. To see an example of a solved problem that involves rolling with relative slipping, see The Physics Of Billiards. Scroll down near the end of the page to the section entitled: "A Closer Look At Relative Slipping". 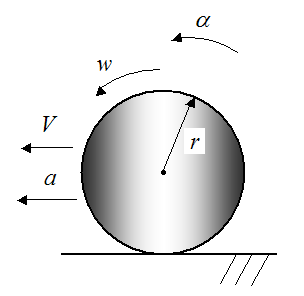 In this section, general equations are given for rolling with relative slipping, on a flat surface. It is useful to study this section, and then use the results for similar problems that you run into.